The hunt for Kony and the LRA has gained momentum over the past few months due to the focused collaborative efforts of a U.S. team of military advisors and Ugandan forces, or UPDF. However, unrest in the Central African Republic, or CAR, following the March 24 coup by Seleka rebels, has halted counter-LRA operations and threatens to permanently jeopardize progress in the fight to end Joseph Kony’s decades-long rampage. 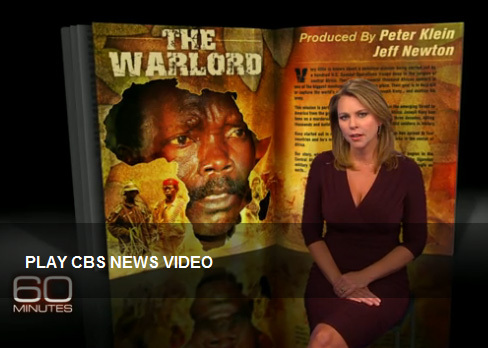 The 60 Minutes segment also outlined the nature of the momentum gained during recent anti-LRA operations. Logan’s report highlighted how encouraging defections from the LRA and obtaining strategic information from former fighters has been a high priority for joint anti-LRA operations. Collaboration with Caesar Acellam, a former top LRA commander, has proved incredibly important in promoting defections. Kurt Crytzer, former force commander for the U.S. advisors, confirms one of the ways in which this strategy works. “Members of the LRA see someone who was as senior as Caeser Acellam and he’s safe and well, that will convince people that there’s a safe way out of this.” Mechanisms that encourage the acquisition and strategic use of human intelligence continue to be crucial in the effort to end the LRA’s reign of terror. If Uganda and the U.S. advisors can stay committed to ending the LRA, even in the face of unrest in CAR, the progress in LRA counter-operations seen over recent months will not be eclipsed by current inaction. If operations resume, Colonel Crytzer believes that the end could be near: “I believe we are [getting closer to Kony]. I can wake up in the morning honestly and say, “Is today the day?” If operations resume, however, the U.S. and its regional partners will need to address gaps in the current efforts: a lack of access to LRA safe havens, inadequate real-time intelligence, and the need for an elite unit to apprehend the group’s top leaders. Recently, the UPDF stated its intention to continue anti-LRA operations. The operations, however, remain stalled as negotiations regarding the political situation in CAR unfold. The longer operations are postponed in CAR, the more time Kony has to regroup, recruit, and resume his campaign of terror.